OF THE WILHELM REICH DOCUMENTARY FILM PROJECT! 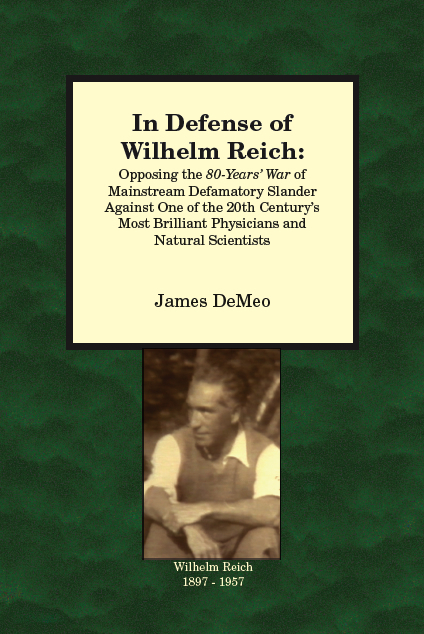 -and join supporters from Africa, Asia, Europe, Mexico, South America and the United States in providing the budget for a factually accurate documentary film that will help to correct the false narratives of Wilhelm Reich. If your life or your work have been inspired or touched in any way by Reich’s rich legacy, please join this effort now. This is your film, too! The KICKSTARTER CAMPAIGN IS NOW UNDERWAY to raise money for the production of the Wilhelm Reich Documentary Film Project. This 31-day campaign went live on Tuesday evening and will conclude on Friday, November 21. 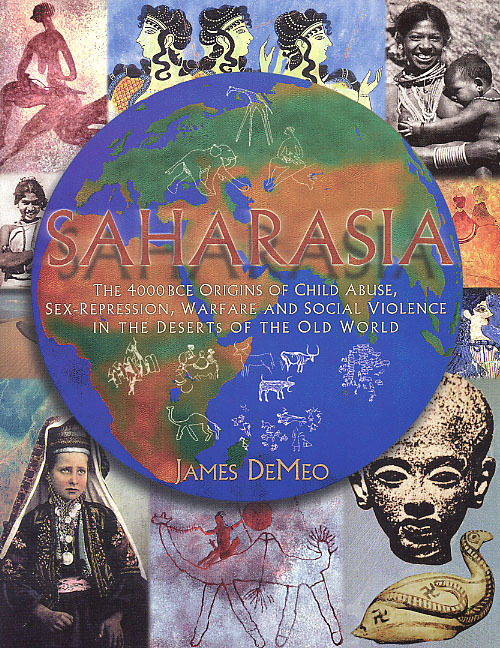 Please click on the link below: (1) Watch the project video (2) Read the project page (3) Support this film in a way that is comfortable for you (4) And PLEASE SPREAD THE WORD by sending this link to your friends, colleagues, lists and networks, and by "Liking" us on your Facebook pages. I recently gave an invited lecture at the Ninth Annual Conference on the Physics, Chemistry and Biology of Water, as held in Pamporovo, Bulgaria, 9-12 October 2014. This conference was attended by top water research scientists from around the world, including Nobel laureates and long-time investigators into the related subjects of water memory, water structure, and biophoton phenomenon. The subject of my own lecture was new findings made at the OBRL, on changes in water spectroscopy — absorbance and fluorescence — after being charging inside Wilhelm Reich’s orgone energy accumulators, as well as from exposure to other enclosure materials. 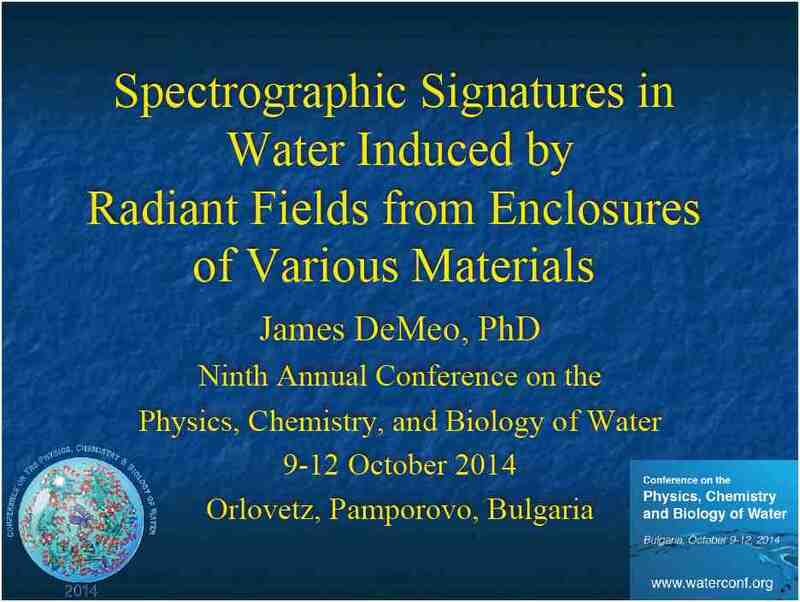 James DeMeo: "Spectrographic Signatures in Water Induced by Radiant Fields from Enclosures of Various Materials." This paper follows a theme of research underway at OBRL over the last several years, investigating changes in the properties of water from exposure to the orgone accumulator. While prior work demonstrated clear absorption signatures in distilled water in the far UV frequencies over ~220-280 nm and peaking around 240 nm, the new research presented at this year’s Water Conference documented a fluorescence reaction in orgone-charged distilled water which ranged across near UV and bluish frequencies. This important new finding shows that when orgone charged water is subjected to far UV light (~200-300 nm), it fluoresces or luminates in the near UV and bluish frequenices, across the range from ~270-500 nm. This is not the case with uncharged samples derived from the same commercial jug of distilled water, used as a control in every case. The suggestion from these experiments is, orgone energy is attracted into the water, and it is the orgone which glows under excitation, and not necessarily the water itself. 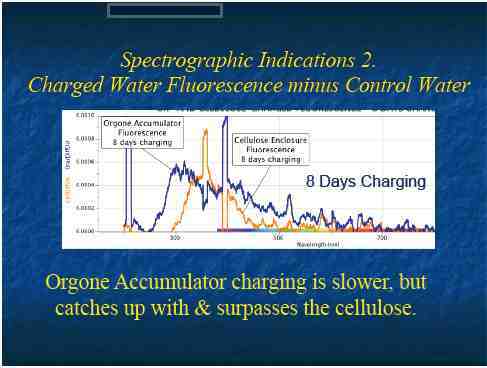 Or the orgone-charge changes the structural properties of the water such that the newly-configured water molecules have significantly different absorption and fluorescence characteristics. Whatever are the theoretical issues, the actual experimental findings provide a good experimental proof for Wilhelm Reich’s assertions about bluish glows in liquid water and, by inference, in the moisture-containing atmosphere. Solar energy contains trace quantities of life-beneficial UV frequencies. These frequencies can create an excitation of water in pristine lakes or oceans, or hot springs and other living, healing waters, or masses of glacial ice, such that they develop a bluish coloration highly suggestive of a fluorescing glow. Such phenomena have been observed by ordinary people and naturalists over millennia, where the water creates its own bluish resonance and glowing effects which are directly observable. But the new fluorescence experiments suggest these glowing effects will be most pronounced and visible where the properties of living water, filled with life-energy, are present. In other cases of rather "dead" or ordinary water, such bluish glowing characteristics may be entirely absent, or existing at very low levels. Reich’s original arguments and theory on such optical phenomenon are now supported with laboratory proofs, and thereby constitute a challenge to the long-held belief that Rayleigh scattering effects are the one and only explanation for such bluish colorations in nature. The Rayleigh light-scattering theory will retain validity for optical effects within dense transparent minerals or where prism-like effects from small particulates can be clearly documented, and also reproduced in laboratory environments. However, this idea from classical mechanics of the late 1800s has been applied dogmatically over many decades, and is wrongfully used as a club against newer ideas, such as Reich’s observations on the bluish glows in nature being due to what he termed orgonotic excitation. By Reich’s theory, living and non-living materials may generate their own bluish-glowing haloes or energy fields, as a function of the orgone life-energy contained within them. 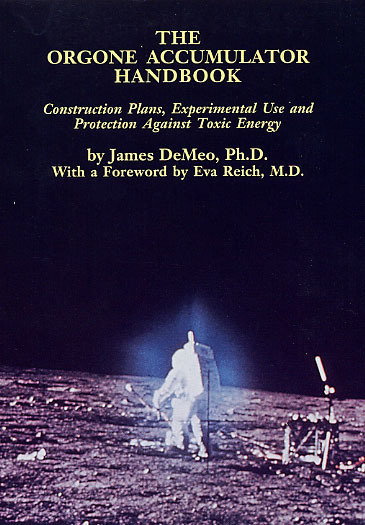 He extended his orgone theory to assert how it filled all of space — similar to the older concept of a luminiferous cosmic ether — and thereby could help to understand the bluish glows observed across planetary atmospheres, including the blues of the sky itself, or the bluish glows seen inside high-vacuum tubes, which by inference appear related to the bluish haloes surrounding entire galaxies. In these cases, cosmic water may prove to be at work also, given newer discoveries that hydrogen and oxygen are among the most abundant atoms in deep space, suggesting the most abundant molecule in the universe is probably water, H2O. Other bluish glowing phenomenon, such as biophotons or the subtle or profound blue colors of glacial ice or thermal hot springs, or deep blue lakes in high mountain areas, or even certain bee-attracting dark blue flowers (ie, lobelia), all suggest phenomenon which fall under Reich’s theoretical expectations. They all yield up a deep blue glowing characteristic along with near UV frequencies when excited by natural sunlight. To the studied eye these colors appear as a glow or luminescence, and not some purely mechanical effect of light-scattering or reflectance. The same can be said of the bluish glows seen in Reich’s bions, and surrounding red blood cells and some microbes when viewed in the light-microscope with the best color-corrected optics, under living conditions. 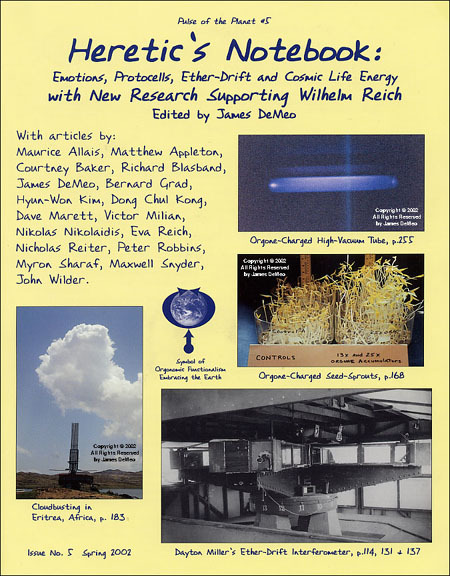 Reich often wrote how there was a "mutual affinity and attraction" between orgone energy and water, and how orgonotic excitation could cause the organism to "glow" figuratively. He observed such glows quite literally in other aspects of biology and nature. This is now affirmed with good experimental proof via spectroscopy, at least so far as water is concerned. A lot of interesting research was presented at the Water conference, helping me to understand the related practical aspects of bio-photons or excited electrons, or water in excited states, etc. These ideas carry the assumption that there is something more going within both living and non-living matter, beyond what can be explained by ordinary chemical theory. Such phenomena are possibly related to this one-same orgone-charge in water, imparted by the typical orgone accumulator, but also by certain high dielectric materials. The other presenters sometimes spoke about the bluish color anomalies, much as seen in typical Cherenkov radiation, but without the necessity of hard and aggressive high-energy atomic radiation for excitation. A case in point is Gerald Pollack’s Exclusion-Zone (EZ) water findings, which were another major theme of the Water Conference. Water exposed to Nafion high-dielectric material, as Pollack found, creates an EZ property within water along its edges, creating very thick molecular layers with highly unusual properties, and which also absorb UV light, emitting a slight bluish color visible to the eye. This is in keeping with my own findings on the orgone accumuator charging of water, but more directly related to the effects of high-dielectric cellulose acetate, which can induce such influences into water at a much faster rate than the orgone accumulator by itself. Cellulose-acetate charged water also yields a blue fluorescence, similar to water charged inside an orgone accumulator, but not exactly so. A mystery exists in how the cellulose acetate material does not impart the life-positive influences of the orgone accumulator. It severely stunts the growth of bean seedlings. One explanation could be, the cellulose acetate provides "too much" of a charge "too quick", thereby inhibiting plant growth, in opposition to the more slow-charging effects of the orgone accumulator. Additionally, unlike Pollack’s EZ water effects, which required direct physical contact between the Nafion dielectric material and water, my own experiments showed a similar influence was possible without any physical contact between the water and its enclosure. A radiant field effect comes off the walls of the orgone accumulator, and other enclosure materials, which can influence the water’s properties quite directly. This radiant, non-contact, non-chemical influence is of course well-documented in regards to the orgone accumulator itself, which creates many biological and physical influences and anomalies within its interior. Cellulose acetate has a natural origins from pulverized wood, though the acetate form comes from chemical processing, rendering it into a transparent and rigid plastic-like material. All forms of natural surface and atmospheric water have aeons of exposure to such woody cellulose materials, in the living cover of the planetary surface. And we also know, healthy forests also yield a bluish glow that can be seen and photographed. Such phenomenon are absent from or extremely rare above barren rock desert regions, by comparison. Instead, the harsh deserts of the world, lacking in water, can even show a diminished bluish glow overhead in the cloud-free sky. This has been seen on satellite images, where the blue color of the "Earth’s Aura" is brilliant over oceans, forests and grasslands, but diminished into a fuzzy dim blue-grey over the big deserts of the world. We should therefore not be too surprised to find the acetate form of cellulose, a material derived from woody forests, retains unusual properties related to nature’s own bluish glowing phenomenon. This may give us insights about how and why biophoton research also yields similar UV-blue frequencies, and may be obtained from a variety of organisms and materials which share our existence on Earth. Under the right stimulating excitation, there is a bursting forth of visible light as a reaction, notably within the near-UV and blue frequencies. These new findings from spectroscopy put legs under some of the lesser-explored aspects of Reich’s theoretical work. For example, as Reich argued, the full spectra of light as seen in what we call "daylight", may be produced as a lumination-reaction from intense Solar excitation of the Earth’s orgone energy envelope. If eventually proven out, it would give support to his "outrageous idea" that light may be a local phenomenon, separate from the excitation forces which stimulate it. In some cases, for some frequencies, this is already proven out. A more in-depth paper will soon be organized for publication on these findings. Also, my personal thanks to Prof. Gerald Pollack, for the kind invitation to speak on these controversial topics at the Water Conference. PS. Please help the research efforts underway at OBRL, with your tax-deductible donation. A full text paper of this presentation and related findings from the OBRL may be published in 2015. Please consider making a donation to OBRL such that we may continue with our research program.